This analyzer package has it all. The MDAI all grown up ! The single card chassis comes standard with 16 Digital Inputs, 16 Analog Inputs and 4 relay controlled outputs. Internal DTMF radio, TCP stack, on board Compact Flash, lots of horsepower in a cost effective package. 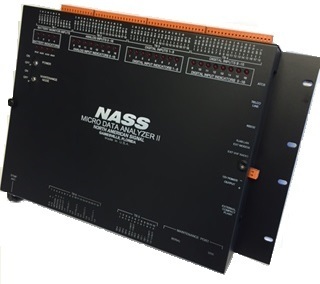 The Micro Data Analyzer II unit (MDA II) is a processor based analysis system utilized for applications involving supervisory control and data acquisition. The system can be configured for interface to wayside equipment to allow for event recording, real time health monitoring, remote control and diagnostic port interface. The unit can operate independently at a wayside facility or be configured with a host of remote telemetry packages to allow for centralized reporting. The MDA II is software configurable by the user for the specified application. In large applications, the Micro Data Analyzer can be connected by way of a RS422 Serial loop to a Universal Data Analyzer or additional Micro Data Analyzers to offer additional capacity or connectivity to a remote facility. Smaller in profile but not on functionality than the Universal Data Analyzer, the MDA II is designed to provide you with a cost-effective solution to your remote control and monitoring requirements. Equipped with 16 Isolated Analog Inputs, 16 Digital Inputs and 4 relay-controlled outputs the MDA II is a cost-effective solution for site analysis. Equip the MDA II with a 6-watt UHF/VHF DTMF radio transceiver operating on your licensed frequency provides control from the ground with a standard 2-way portable radio. Equipped with customer configured “voice annunciation features,” receive over the air command confirmation on your 2-way radio or base equipment. The Micro Data Analyzer II unit is a self-contained processor based motherboard configuration mounted in an Aluminum Chassis. The Chassis contains a removable cover accessing the system electronics. The chassis can be wall or shelf mounted. The cover includes detail identification of the systems interconnections. If you have to read this manual to obtain information, then we have done something wrong in the production process. Everything you need to know about the visual indicators and the detailed interconnect of the system is identified on the front cover. To access the system electronics, unscrew cover fasteners located on the left and right side of the cover. Depending on the system configuration ordered from the factory, the unit will contain additional module interfaces such as an internal DTMF Radio or a telemetry TCP/IP interface unit. The MDA II comes equipped with 16 Isolated Digital inputs, 16 Analog Inputs consisting of 4 Battery Monitors, 4 current sensor monitors, and 8 general-purpose analog inputs, along with 4 relay controlled outputs. Based around Motorola’s 68HC12 processor once used in 95% of the nation’s automobiles, the system is designed to work when the rest of your systems are not. Isolated with an Internal DC-DC Converter, the unit can operate on a wide range of Input voltages from 8-36 Volts DC. ​For more information click on the manual link above.